>Courtesy of David Codrea of the War on Guns blog, here’s a great idea on outing both the Republican so-called “Second Amendment supporters” and the ongoing anti-gun agenda of the CNN media empire. Go here and follow David’s instructions, please. Then bookmark his site for updates and reminders. >Hope to see you here this weekend! Posted on August 21, 2007 | Comments Off on >August 28 "Ammo Buy"
>Thanks to the great work of David Codrea of the War on Guns blog, a massive nationwide “ammo buy” is being organized via the Internet gun community as a response to this silliness from the usual hoplophobic suspects. Go here to learn the latest. Then help spread the word yourself – please! Comments Off on >August 28 "Ammo Buy"
Kudos to the folks at Langhorne Rod & Gun Club in eastern Pennsylvania who just put on this outstanding practical match. Take a look and start thinking about how you can put together a similar training event/match in your area. People who believe in the late Second Amendment’s actual meaning are routinely demonized – by mainstreamers and gunowners alike – as “radicals”, “nutcases”, and “militia types”. You know, the people who should have their guns removed by the omniscient, omnipresent, ever-benevolent State. After reading this article by Bruce Bawer, you probably should add “enemy of peace” to that string of epithets. Turn-the-other-cheek pacifism only flourishes among the more prosperous classes, or among workers who have in some way escaped from their own class. The real working class . . . are never really pacifist, because their life teaches them something different. To abjure violence, it is necessary to have no experience of it. >Becoming a Model "Bad Citizen"
Posted on August 16, 2007 | Comments Off on >Becoming a Model "Bad Citizen"
>JPFO posted this alert earlier today, describing several ominous developments in the growing American state security apparatus, including pain beams, robot law enforcers, and the increased domestic use of spy satellites. 1) Claire Wolfe’s The Freedom Outlaw’s Handbook: 179 Things to Do ‘Til the Revolution: Even if you never take any of the more than 179 steps towards greater personal freedom described by Ms. Wolfe, you and your soul will benefit greatly from the first read and all subsequent re-reads. Mr. Mack’s books are a fine start to educating yourself and others on what will need to be done in the coming Dark Years. Most commendably, “Invisible Resistance” is free from the bravado and systemic delusions that permeate much modern-day resistance lore. 3) Take the time to read Martin Luther King’s Letter from a Birmingham Jail in its entirety, reflecting on its message of implacable resistance to tyranny and injustice. Most importantly, consider for yourself the morality of resistance to injustice versus the immorality of acquiescence in the societal suicide planned by the transnational Western elites, not only for themselves but our families as well. Then act bravely and wisely. A long Night is coming, and a new Dawn is but the faintest of possibilities. Comments Off on >Becoming a Model "Bad Citizen"
Please Tell Me How I Wake Up Back in the Old America…. Posted on August 11, 2007 | Comments Off on Please Tell Me How I Wake Up Back in the Old America…. If you have a few minutes this weekend, get yourself a fresh cup of coffee (or stronger, if that’s your thing) and take the time to work your way through the links in this essay by Kevin Baker of The Smallest Minority. I am almost physically ill with the dread I am feeling right now. I’ve said before that I have thought about armed revolution before. It is something that I think everyone who considers himself a patriot has to think about ahead of time. You might think about it and say “never”, but you need to think about it. I am reminded of the cannibal paradox. The paradox is that there are a lot of people in starvation scenarios who turn to cannibalism and starve anyways. They starve because the cannibalism taboo is so strong that they wait too long and are past the point of no return before they do what they need to survive. There is a point of no return when it comes to revolution. Just remember – never, ever get on the government bus to the “emergency shelter/evacuation camp”. Once you do, you are irretrievably finished. Comments Off on Please Tell Me How I Wake Up Back in the Old America…. >Grab your gear and join us on August 25-26 in Douglas, WY for our next Intermediate Rifle Clinic! • Enough food/water/sungear/raingear to get you through each day’s shooting; don’t forget the aspirin! NOTE: Wyoming State Shooting Association (WSSA) members with proof of current membership will be admitted for both days at a reduced rate of $75 per person. We will have WSSA membership forms with us ($15/year), but any non-members who want to take advantage of this discount should go here and sign up for WSSA membership in advance. Prerequisites: Each shooter will be expected at all times to adhere to the standard gun safety rules, with special attention to muzzle and trigger finger control. Your weekend will be more enjoyable if your rifle is cleaned, properly lubricated, and zeroed at 200 yards. 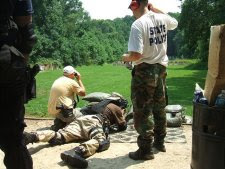 All shooters will have an opportunity to zero their rifles at appropriate distances. Make sure to remember your cleaning equipment, lubricants, and any necessary tools/manuals for all of your gear. Finally – this location is in the high desert. Every participant should be rigged with enough clothing, water, and other supplies to enjoy two very full and active days in 100 degree, high UV conditions. Rally point details: All shooters should meet no later than 7:30 AM (7 AM if you’re eating breakfast) each morning at the Broken Wheel Truck Stop Restaurant. It’s on the right just off the first Douglas exit on 25 North. As a group, we will then proceed to the shooting location for the day. Note that the shooting location for each day may be different, so assembly each morning at the rally point will be a necessity. It will take less than 30 minutes to drive to the range.